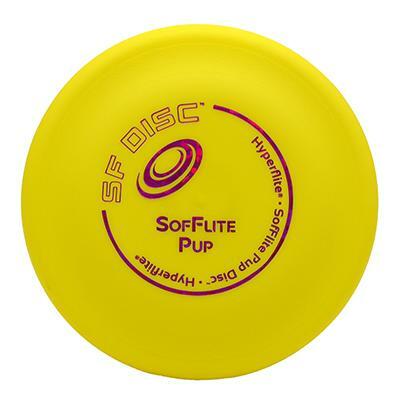 As the official disc of the World Canine Disc Championship Series, Hyperflite dog discs are truly technology in motion. The Hyperflite SofFlite Pup Disc is a professional quality disc that is softer than the Jawz series. Ideal for dogs with sensitive mouths and puppies in training. Made with modern polymers molded into an advanced aerodynamic form, Hyperflite discs will help you bring out the athlete in your dog! Hyperflite discs are not chew toys. Opaque bright yellow disc with blue lettering; disc is 7-inches across and weighs a mere 70 grams (2.46-oz)! X-Flash anti-glare technology is incorporated into the disc, for enhanced visibility. Competition approved.